Nomura: Who Is The Source Of "Short Gamma" Moving The Market Higher? After two days of torrid moves higher in the market - a 2-day S&P rally into month end of +2.67% which was the biggest since February and the third biggest since June 2016 - and one which appears set to continue today, some are wondering if there is an unknown source of short-gamma who is "forced" to chase stocks higher - i.e., caught in a "negative convexity" trap - Nomura's Charlie McElligott confirms that the US stock market continues to trade "like there’s an implicit & incremental source of "short gamma" in the market" and suggests that said "short gamma" would likely be contained within the “fundamental” universe (both hedge and mutual funds), who are not actually short option delta but are increasingly likely to act as “forced buyers” the higher stocks rise. The rip higher is taking place after last month's 1) "mass de-gross/cutting of nets" and 2) enormous reduction of “market” factor risk exposure which crippled relative hedge fund exposure, especially among long/short equity funds (here, McElligott observes that "Beta" market-neutral was -10.9% in Oct despite including yday’s +2.9% rally — the sixth worst month for the factor since 2010 — as crowded portfolio positioning “long high beta / short low beta” was liquidated). Framing the dynamic in terms of a "gamma short" or continued "forced" chasing is important, as many doubt the ability for funds to "play offense" following the extreme performance-pain suffered over the past few months; however, as the Nomura strategist writes they are de facto “getting short-er” the higher the market moves in their absence - thus to McElligott, they are “dynamically hedging” with spastic trading in Spooz (as opposed to options due to their “richness” right now). Meanwhile, the systematic funds have already jumped on board, and according to Nomura calculations the equity “gap higher” (S&P minis +4.8% since Monday night’s low-tick) has forced incremental Systematic fund releveraging as well in U.S. Equities: as a result, the Nomura Trend CTA model shows SPX positioning now “+60% Long” from “+31% Long” two days ago; Russell to “+60% Long” from “-100% Max Short” last week; and Nasdaq to “+60% Long” from just “+31% Long” yesterday. This would also suggest that if stocks again reverse direction lower, the now familiar late day selling burst which is largely the result of quant deleveraging, could once again result in near record low TICK prints, and send the market tumbling once more. Of course, a reversal in the recent negative data trend would ultimately be bearish for risk assets, as it will reinforce Powell's thinking that the neutral rate is well higher, and needs a "symmetric" overshoot. The irony is that with the "data-driven" Fed having a lot of new info to digest over the next few days, even as U.S. financial conditions are “tightening” further at this moment, McElligott concludes that "markets show an asymmetric bias to “good data” perversely sowing the seeds for our next inevitable risk-asset tantrum, especially with the “QT impulse” accelerating again following yesterday’s big SOMA run-off and the upcoming on Nov 21st." 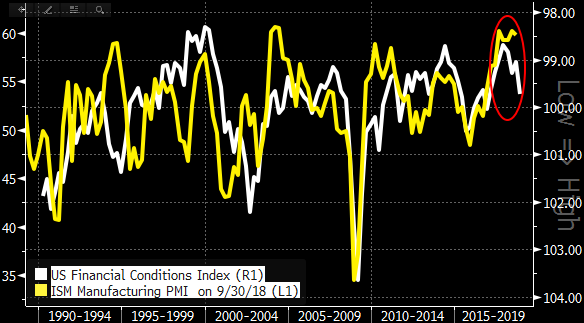 In this regard, a big "tell" will be the ISM Manufacturing Index, which has historically been highly correlated with US financial conditions. After the near record prints in recent months, one can argue that a sharp move lower is now inevitable.